The latest announcement of the People’s Liberation Army (PLA) cutting its size by 50% is unsurprising yet consequential. This steep reduction brings about a structural transformation announced by President Xi Jinping and consistent with the military reforms introduced in 2015. The composition and disposition of Chinese military power today has changed significantly. The PLA’s transformation into a more streamlined fighting force has been nothing short of spectacular given the amount of internal bureaucratic and institutional resistance there was to bringing about a change in its force structure. Chinese military power is aimed at defeating the adversary without actually engaging in active combat. 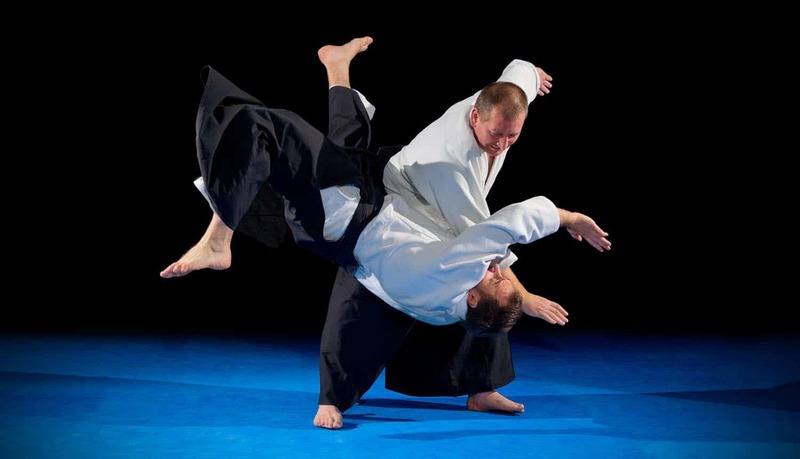 In the event the latter does not occur, China would prefer subduing the opponent with overwhelming force at low cost. It corresponds roughly to the balance between attrition and manoeuvre. Given that the Chinese military was largely following the Second World War operational models, its overhaul was indeed deemed necessary by policymakers. The PLA’s experience of warfighting post Second World War did impress upon its leadership, particularly Deng Xiaoping, the importance of moving away from fighting debilitating wars that claimed the lives of too many fighting personnel. India gains little by engaging the Taliban directly at this stage, says Amar Sinha, former Ambassador to Afghanistan and member of the National Security Advisory Board, countering Army chief General B.P. Rawat’s call for India to ‘join the bandwagon’ in talks. 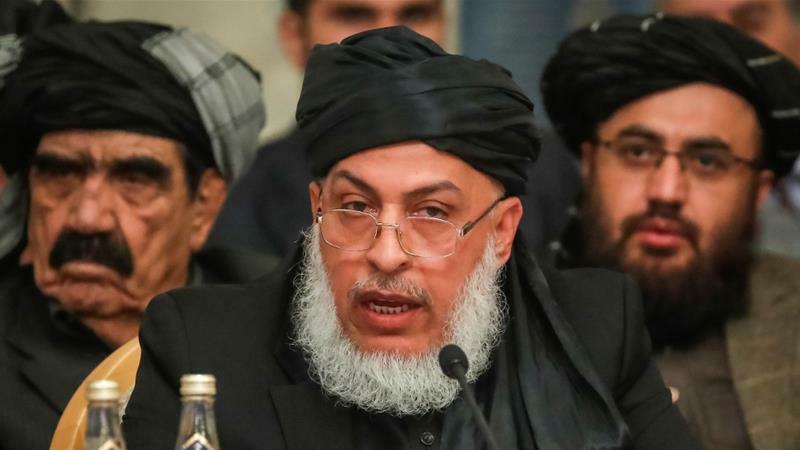 On Wednesday, a two-day ‘intra-Afghan’ dialogue of Afghan leaders and the Taliban, which did not include the Ghani government, ended in Moscow. Has the Ghani government been sidelined in the current talks between U.S.-Taliban and in Russia? Frankly, that is the inference anybody would draw. I don’t think the U.S. wanted to sideline him and even (special envoy) Khalilzad has said that after the initial talks with the Taliban, there must be a ceasefire and an intra-Afghan dialogue. But this is a fact, that neither the U.S. nor Russia have the Ghani government at the table at present. India has taken a position on standing with the government in Kabul and not engaging the Taliban directly … has it been left out of the Taliban process as a result? Afghanistan: what price tag do we put on strategic security? 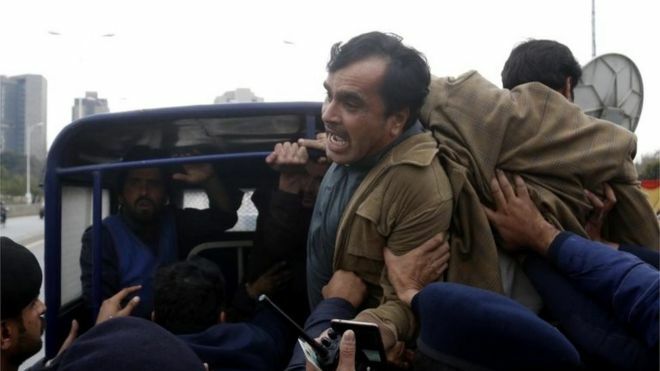 One of the most galling whines that has characterised the take of Indian politicians, officials and analysts on the deteriorating situation in Afghanistan is the threat this poses to Indian investments in that country. Apart from being insulting to our Afghan allies and friends, it is also reflective of the pettiness and penny-pinching attitude of India's strategic community on an issue that they themselves label as being critical for India's strategic security. The constant refrain of the $2 billion (or is it $3 billion?) investment India has made in infrastructure projects and institution- and capacity-building in Afghanistan is flung in everyone’s face to justify Indian interest in Afghanistan. But India's interests in Afghanistan transcend the bean-counter’s approach to any problem—India doesn’t need to wave the bill to justify its interests in Afghanistan. Even if we had spent nothing, or spent 10 times the amount we claim to have spent, India will always have a legitimate interest in Afghanistan’s stability and security. Afghanistan’s presidential race is taking shape amid peace talks between the United States and the Taliban insurgents, who so far have refused to talk with the government. On January 27, Zalmay Khalilzad, the U.S. special envoy on Afghan reconciliation, visited Afghanistan to brief and consult with the president after six days of consecutive talks with representatives of the Taliban insurgents in Doha, Qatar. Khalilzad said in an interview with a local television station that the Taliban refused to talk with the current Afghan government, among other reasons, because then the talks would give credit to one candidate: current President Ashraf Ghani. Ghani, along with Chief Executive Abdullah Abdullah, entered the race on the last day of registration for the presidential election, which is scheduled for July 20. The peace talks went on uninterrupted, a marathon session for six intense days, yet barely a moment in a war that has lasted so much longer. Still, Zalmay Khalilzad, U.S. Special Representative for Afghanistan Reconciliation, emerged from the negotiations with the Taliban in Qatar last month with a message of hope, choosing to broadcast his message via a social media platform that didn’t even exist when the conflict in Afghanistan began. Having assumed his assignment to end the longest war in American history, Khalilzad was upbeat. 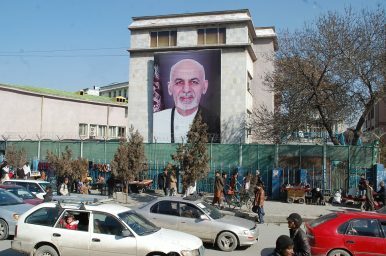 He went so far as to signal during a recent interview with a local television station in Kabul that “it is possible” to reach a peace deal with the Taliban before this year’s presidential elections in Afghanistan ­– now delayed until July. Such optimism. But this hope for a political solution suggests U.S. officials lack a concrete understanding of the view about negotiations from the men that sit on the other side of the table. It’s not that the Taliban is shy about expressing its view. A trove of information in the Pashto language is published online, edicts, orders, fatwas, and manifestos; all waiting to be examined. Since Donald Trump’s ascent to the presidency, the trivia quotient in the average American’s daily news feed has grown like so many toadstools in a compost heap. We’re living in Trump World, folks. Never in the history of journalism have so many reporters, editors and pundits expended so much energy fixating on one particular target, while other larger prey frolic unmolested within sight. As diversion or entertainment — or as a way to make a buck or win 15 seconds of fame — this development is not without value. Yet the overall impact on our democracy is problematic. In Trump World, journalistic importance correlates almost exclusively with relevance to the Trump saga. To the mainstream media (Fox News excepted), that saga centers on efforts to oust the president from office before he destroys the republic or blows up the planet. Is Afghanistan Ready for Peace? Zalmay Khalilzad, the United States’ envoy for Afghan reconciliation, has breathed new life into attempts to conduct peace talks between the Afghan government and the Taliban. Having met with Taliban representatives in Qatar and lobbied leaders in Afghanistan and Pakistan, Khalilzad now says he is “cautiously optimistic” about reaching a peace deal by April of next year. Yet as far as Taliban leaders are concerned, the group has little reason to commit to a peace process: it is on a winning streak. The Taliban control key Afghan highways and are conducting targeted assassinations across the country. They have made important territorial gains and now have complete or partial control over some 250 of about 400 districts. These gains are not sufficient to pose an existential threat to an Afghan government with U.S. backing, but they have emboldened the Taliban to keep fighting, in the hope of eventually eroding U.S. resolve. Even if Khalilzad manages to bring the Taliban to the table, don’t expect his efforts to produce a lasting peace anytime soon. Why do some protests get reported in Pakistan and others not? M Ilyas Khan examines a story of human rights abuses the media is reluctant to cover and the authorities do not want to be told. Pakistan's vibrant, at times almost cacophonic media, is struggling to report a fundamental contradiction in state policy. This was at its most visible this week outside Islamabad's National Press Club. An open ground outside the club premises - which some call Pakistan's Hyde Park because it is used for gatherings and protests - was occupied by a few hundred students from religious seminaries linked to a banned militant group. On January 28, following six consecutive days of talks in Qatar's capital Doha, Washington's main negotiator Zalmay Khalilzad announced that the US and the Taliban finally have a "draft framework" in place for a deal which could pave the way for peace talks with the Afghan government. Khalilzad's comments undoubtedly ignited hopes of a breakthrough in the grinding 17-year conflict, but neither the US nor the Taliban officials offered any details on the specifics of the framework. Historically, due to its strategic location,Afghanistan often served as a battleground on which global and regional powers settled their rivalries. Series of invasions, interventions, wars and long-term confrontations caused major devastation and loss for all involved parties, with the highest price inevitably being paid by the Afghan nation. COLOMBO -- For about three months, confidants of Maldivian President Ibrahim Solih have been holed up in an oceanfront building in Male, sifting through mountains of documents to answer an urgent question: How much money, exactly, does the region's smallest country owe China? After years of pushing into South Asia with multibillion-dollar Belt and Road infrastructure projects, China is encountering real pushback. Larger nations, too, are having second thoughts and signaling to Beijing that it will no longer be business as usual. In the Maldives, the uncertainty over the obligations stems from a frosty exchange between Chinese Ambassador Zhang Lizhong and Mohamed Nasheed, a former president and now an adviser to Solih. It reportedly happened a few weeks before Solih's inauguration in November, after his surprise victory over pro-China incumbent Abdulla Yameen. The Trump administration is taking seriously the entire spectrum of economic challenges related to China that impact our nation. For decades, prior administrations have either ignored the issues or accepted Chinese lies, fabrications and excuses without any pushback. Fortunately, there are no internal political battles over this area — so we can expect the excellent team President Trump has assembled to “work these issues” will succeed. Since the 2016 presidential campaign, Mr. Trump has been outspoken and consistent: That the enormous trade imbalance with China and the grossly unfair tariffs imposed on American exports must end. The trade imbalance is now on the order of $300 billion annually, and every day artificially low-cost Chinese goods enter the United States with minimal import tariffs. “China will not, repeat, not repeat the old practice of a strong country seeking hegemony,” Wang Yi, China’s foreign minister, said last September. It was a message that Chinese officials have been pushing ever since their country’s spectacular rise began. For decades, they have been at pains to downplay China’s power and reassure other countries—especially the United States—of its benign intentions. Jiang Zemin, China’s leader in the 1990s, called for mutual trust, mutual benefit, equality, and cooperation in the country’s foreign relations. Under Hu Jintao, who took the reins of power in 2002, “peaceful development” became the phrase of the moment. The current president, Xi Jinping, insisted in September 2017 that China “lacks the gene” that drives great powers to seek hegemony. It is easy to dismiss such protestations as simple deceit. In fact, however, Chinese leaders are telling the truth: Beijing truly does not want to replace Washington at the top of the international system. China has no interest in establishing a web of global alliances, sustaining a far-flung global military presence, sending troops thousands of miles from its borders, leading international institutions that would constrain its own behavior, or spreading its system of government abroad. What Is Xi Jinping Thought? LONDON – In October 2017, at the 19th National Congress of the Communist Party of China, the CPC enshrined in its constitution a new political doctrine: “Xi Jinping Thought on Socialism with Chinese Characteristics in a New Era.” At a time when a rapidly modernizing China is a leading global player, it is tempting to dismiss this doctrine as anachronistic “party-speak” from a bygone age. We succumb to that temptation at our peril. 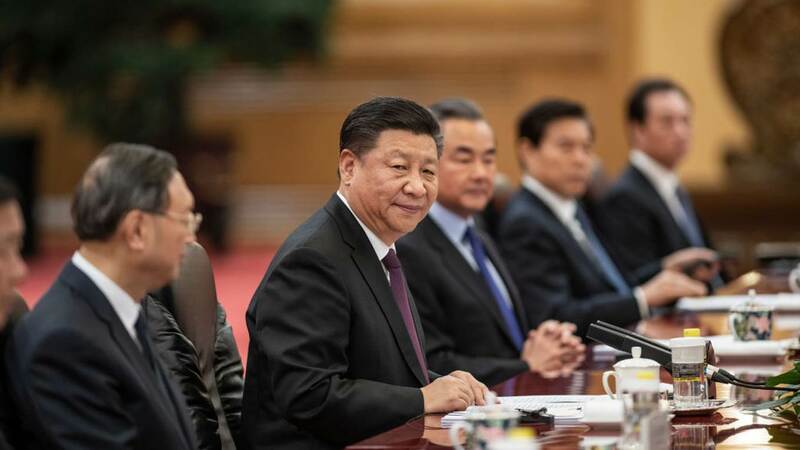 Five months after the constitutional change, the National People’s Congress abolished the presidential term limit, meaning that, barring a political earthquake, Xi – who, at age 65, remains healthy and vigorous – could remain president for perhaps another 20 years. His eponymous doctrine will therefore shape China’s development and global engagement for decades to come, and perhaps longer. Li Minghai of the PLA’s National Defense University wrote that AI will be a key “war-winning mechanism” for China. “Through gunpowder smoke in war, we can perceive that today, war fighting has evolved from bloody struggle for storming castles and capturing territories in the uncivilized and barbaric age into information-driven precision decapitation operations and intense contests in the domain of high intelligence,” Mr. Li stated. 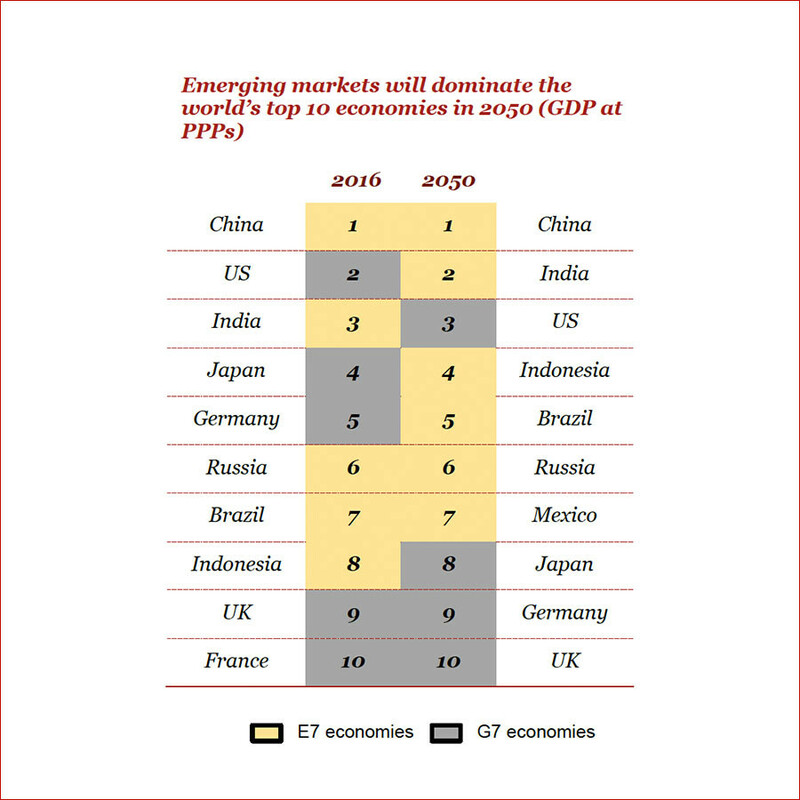 Over the next three decades, the global economy will be dominated by China, and the US economy will lose steam and fall behind India, says consulting firm PricewaterhouseCoopers (PwC). Russia will become the leading European economy ahead of Germany, UK, and Italy with GDP of $7 trillion, according to a PwC report. At a time of rising populism and authoritarianism around the world, Japan stands out as a relative island of social and economic stability. And though it owes its current situation to unique economic and geopolitical circumstances, it might still have something to teach other developed countries. 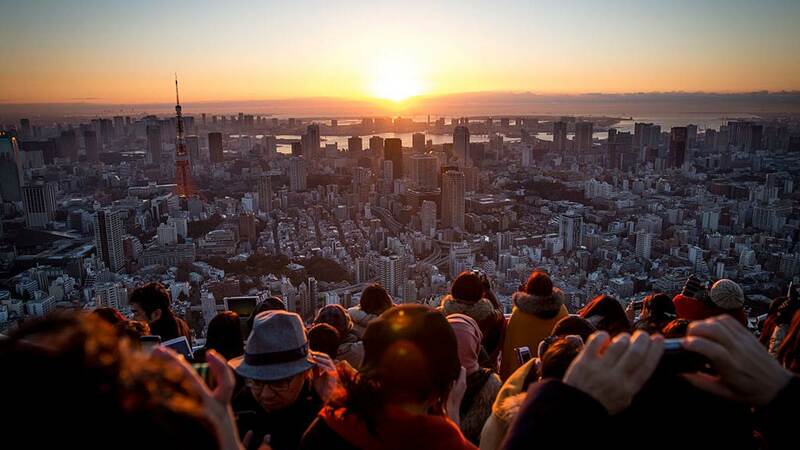 TOKYO – When I participated in the Chatham House/Daiwa Research Institute conference on the post-Brexit Japan-UK relationship in Tokyo last month, it was my first visit back to Japan since my departure from Goldman Sachs almost six years ago. Prior to this trip, I had been visiting the country regularly since 1988, so it was helpful to see things from a slightly more detached perspective. By and large, Japan in 2019 feels relatively stable when compared to other advanced economies. A decade from now, I would not be surprised if it continues to show the highest real (inflation-adjusted) per capita GDP growth rate in the G7. Why do we still use the term Middle East when West Asia is more relevant to Arab nations? Neuroscientists and linguists have demonstrated that the language we speak and the words we use shape how we think. Terminology certainly matters in geopolitics as well, conditioning how we view entire regions of the world. Crucially, our geographic vocabulary evolves to suit the times. The Cold War, for example, was often referred to as the “East-West conflict” but today nobody thinks of Russia as representative of the “East” – when it is China that is clearly the eastern superpower. Unfortunately, when it comes to the Arab, Turkic and Persian realms, the catch-all term “Middle East” continues to hold sway among English speakers. Subsuming any of the geographic distinctions and nuance contained in the Arabic terms Maghreb, Khaleej and Mashriq, the vague “Middle East” continues to represent so much –even as it increasingly means nothing at all. Isn’t it time for our vocabulary to adapt to reality? TEL AVIV: With over 80 percent of Israeli’s commerce carried by sea and its offshore gas fields crucial to the economy, the country is boosting spending on protecting its shipping lanes, littorals and ports with an array of weapons including underwater capabilities, heavily armed patrol boats and new submarines. Hezbollah sees the large natural gas reservoirs and the rigs that probe them in the Mediterranean as potential targets and this puts heavy pressure on the Israeli navy to safeguard them. Global politics has come to a very interesting point: A gradual rise of multipolarity is creating geo-strategic spaces for states to maneuver for their individual interests and, at the same time, opening new avenues of cooperation for shared geo-economic interests. This scenario is compelling states to adjust the undertones of their foreign policies and adapt to the transforming realities. The trickle-down effect of these global changes has helped the emergence of many alignments that are running parallel to one other. For instance, a Russia-China-Pakistan axis seems to be in the making. They are joining hands with one another under the ambit of the Belt and Road Initiative (BRI) and through the Afghan peace and reconciliation process. At the same time, the Russia-India-China strategic triangle emerges as an on-again, off-again phenomenon. Interestingly, in an attempt to build a parallel transnational corridor (International North-South Transport Corridor), Russia, India and Iran are cooperating with one another, leaving China and Pakistan out of the project. 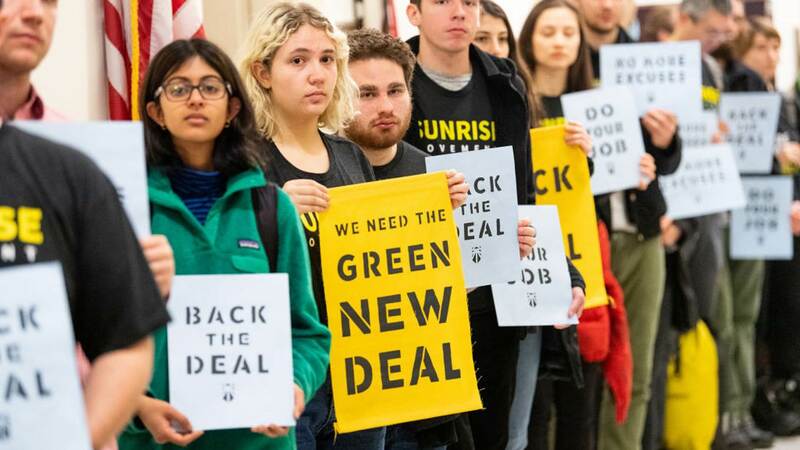 NEW YORK – It’s old news that large segments of society have become deeply unhappy with what they see as “the establishment,” especially the political class. The “Yellow Vest” protests in France, triggered by President Emmanuel Macron’s move to hike fuel taxes in the name of combating climate change, are but the latest example of the scale of this alienation. The standoff pitting Venezuelan President Nicolas Maduro against National Assembly leader Juan Guaido, who declared himself interim president two weeks ago, continues to paralyze the country. 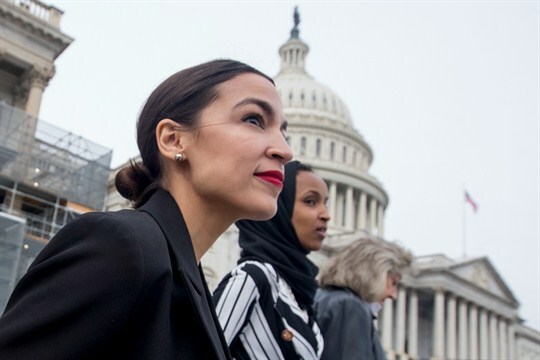 It has also highlighted a political divide outside Venezuela—in particular in the U.S. between advocates and critics of the Trump administration’s pursuit of regime change in Caracas. That debate has broader implications for the formulation of a progressive foreign policy framework in the runup to the U.S. presidential election in 2020. Throughout much of the previous year, China regularly admonished Australia for viewing the former through ‘tinted glasses’ — read ‘Western bias’ — and warned Australia to remain neutral with respect to the deepening tension between the United States and China or face consequences. That ham-fisted diplomacy has had the opposite effect. To a large extent, Australia is ignoring these entreaties. Shinzo Abe’s Japan has emerged as the leader amongst regional democracies when it comes to espousing a vision of a free and open Indo-Pacific, and Australia is right behind Tokyo. Both are the two most forward-leaning of all U.S. allies when it comes to preparedness to stand strong against China. Although last week was eventful—China talks, Brexit debates, among other things—I’m going to take a week off from commenting on current events and instead look at the long term and the changing face of globalization. This is prompted by a McKinsey Global Institute study, Globalization in Transition: The Future of Trade and Value Chains. In brief, what McKinsey found was that while trade continues to increase in absolute terms, although at a slower rate, the share of goods output that is traded, as opposed to consumed domestically, is declining pretty much across the board—from 28.1 percent in 2007 to 22.5 percent in 2017. At the same time, cross-border flows of services have grown over 60 percent faster than goods trade and intangible assets transferred across borders (software, branding, design, etc.) as well as data transfers contribute substantial economic value not adequately represented in national statistics. The document is intended to make commander think through the implications of their new artificial-intelligence tools. The Defense Department will unveil a new artificial intelligence strategy perhaps as early as this week, senior defense officials told Defense One. The strategy — its first ever — will emphasize the creation and tailoring of tools for specific commands and service branches, allowing them to move into AI operations sooner rather than later. “DOD has spent the past 50 years treating AI as a [science and technology] concern. This strategy reflects an additional imperative, which is to translate the technology into decisions and impact in operations,” said one official with direct knowledge of the strategy. Artificial intelligence can help government agencies solve complex public-sector problems. For those that are new at it, here are five factors that can affect the benefits and risks. As artificial intelligence (AI) and machine learning gain momentum, an increasing number of government agencies are considering or starting to use them to improve decision making. 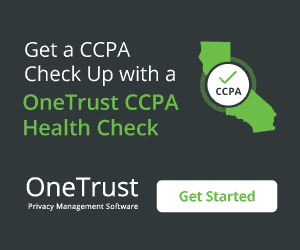 Some examples of compelling applications include those that identify tax-evasion patterns, sort through infrastructure data to target bridge inspections, or sift through health and social-service data to prioritize cases for child welfare and support. They enable governments to perform more efficiently, both improving outcomes and keeping costs down. For years, cyber warfare has been a topic of concern for the world’s leading nations, all of which have outlined scenarios in which they are the victims of either a state or non-state actor using cyber weapons to carry out an attack to cripple their national power grids. As a result, a fundamental shift from defensive to offensive cyber operations is now underway in order to deter these attacks. The United States and its European ally France are at the forefront of this trend. At the beginning of 2019, French Defense Secretary Florence Parly publicly acknowledged in a speech delivered at the Forum International de Cybersecurité in Lille, France that her nation was changing its posture from “active defense” to “offensive cyber capabilities.” This was not just a throwaway line in a speech, either: it was the public articulation of a very real change in the way that France views the global cyber threat matrix. As Parly herself pointed out, “Cyber war has begun.” And France is not about to sit around idly as other nations mobilize offensive cyberspace operations (OCO). The public discussion of 5th generation (5G) mobile telephone service has been seen by many – perhaps most – in the United States as just another step in the evolution of mobile communications, a remarkable scientific and commercial development that has wrought a wide range of benefits world-wide over the preceding quarter-century. 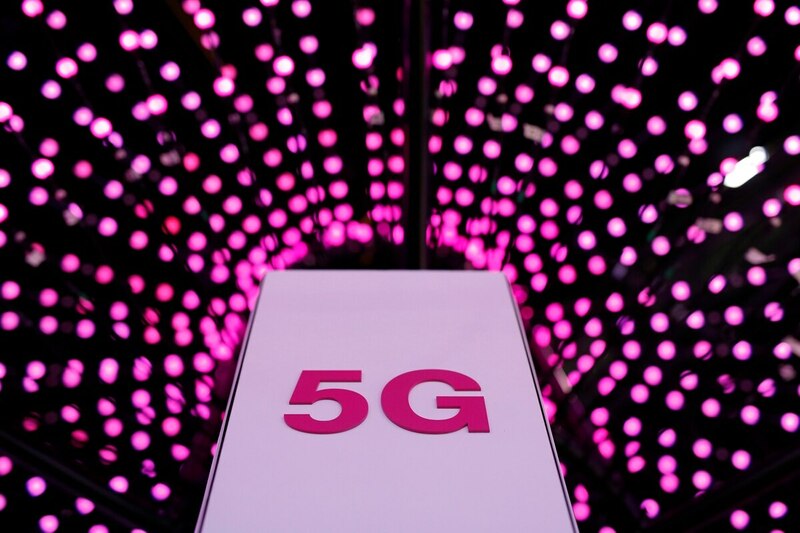 More recently, the focus has shifted to 5G as a proxy for the U.S.-China trade and technology rivalry. The Trump administration’s effort to change the terms-of-trade with China has brought the subject of commercial and international trade consequences of the proliferation of advanced technologies into sharp relief. The U.S. efforts to extradite the chief financial officer of the Chinese telecommunication equipment developer and producer, Huawei from her detention in Canada for export control violations have added a geopolitical spin to what has become an increasingly tangled issue. Five years ago, Satya Nadella took over as CEO at Microsoft, following in the footsteps of Bill Gates and Steve Ballmer. “Having worked with him for more than 20 years, I know that Satya is the right leader at the right time for Microsoft." And right he was. Having managed the transformation to the cloud infrastructure and services business before being appointed CEO, Nadella doubled down on this transformation as CEO, turning Microsoft’s cloud business into an industry-leading powerhouse that generates $30 to $40 billion a year in revenue and billions in profit.